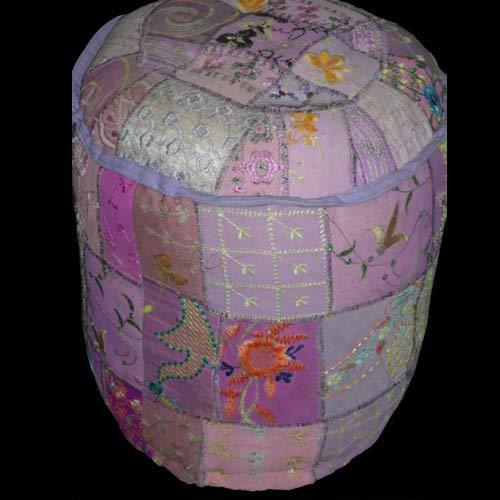 Pioneers in the industry, we offer Pouf Ottoman such as Indian Handmade Pouf, Handmade Indian Stool Pouf, Handmade Sitting Pouf Cotton Poufs, Indian Handmade Cotton Poufs, Jaipuri Hand Made Cotton Pouf, Indian Crocheted Cotton Poufs and many more items from India. 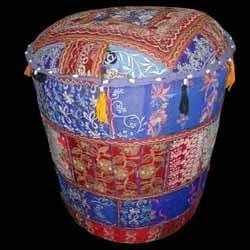 Backed by our rich experience, we are committed towards offering a widespread array of Embroidered Poufs. By utilizing best grade of fabric and modern machinery, our hardworking workers fabricate these qualitative embroidered puffs as per prevailing latest trends. In addition to this, our offered embroidered puffs range is broadly demanded in the market for featuring several attributes like long lasting colors & easy to wash. Customers can take these embroidered puffs from us at market leading rates. We are foremost manufacturer, exporter, wholesaler and supplier of supreme grade of Round Puffs. The offered range of round puffs are fabricated by using optimum quality fabric and leading techniques for to maintaining its compliance with universally set norms. Along with that, our honored customers can obtain this round puffs in numerous stipulations as per their ever-evolving requirements. These round puffs are perfectly checked by our quality specialist for flawless supply. 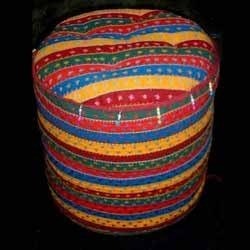 Our organization is engaged in manufacturing and supplying a huge assortment of Decorative Puffs. Our range of Puffs is manufactured using high grade resources that are procured from our reliable and trusted vendors. Available in various design and patterns. 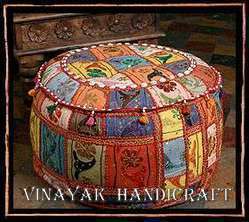 We are foremost manufacturer, exporter, wholesaler and supplier of supreme grade of Round Poufs. 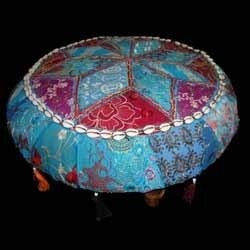 The offered range of round poufs are fabricated by using optimum quality fabric and leading techniques for to maintaining its compliance with universally set norms. Along with that, our honored customers can obtain this round puffs in numerous stipulations as per their ever-evolving requirements. 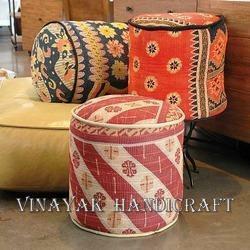 These round poufs are perfectly checked by our quality specialist for flawless supply. 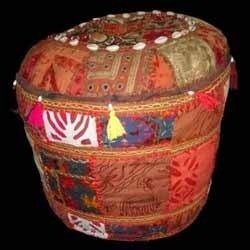 We have gained expertise in the domain, offering a wide array of Stool Pouf. These products are widely demanded by the clients for their beautiful designs and alluring patterns. Quality cotton is used to manufacture these products and known for their fine appearance. The offered products are available in various sizes and colors that can be purchased by the clients as per their requirements.we have manufacturer & supplier our products. 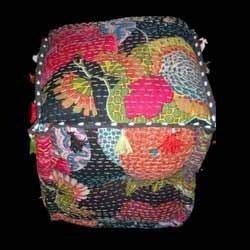 Relying on the skills of our skilled designers we manufacture, supply and export a wide array of Handmade Pouf. These products are suitable to keep in house as they provide astonishing appearance to the place. Our products are able to grab the attention of guests and visitors. 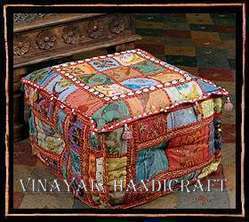 We have raised the quality standards by supplying these Handmade Vintage Kantha Work Poufs in the market. Moreover, to maintain the quality standards we check them under rigorous parameters set by the industry. Backed by our rich experience, we are committed towards offering a widespread array of Embroidered Puffs. By utilizing best grade of fabric and modern machinery, our hardworking workers fabricate these qualitative embroidered puffs as per prevailing latest trends. In addition to this, our offered embroidered puffs range is broadly demanded in the market for featuring several attributes like long lasting colors & easy to wash. Customers can take these embroidered puffs from us at market leading rates.